I love farm-to-table dinners where you know the food prepared has come directly from a farm and is as fresh as you can get -- and there's always bonus points when you can then enjoy that meal outdoors. A dinner I attended last night just totally knocked it out of the park. 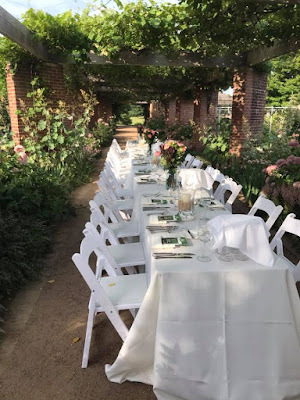 It was a farm-to-table dinner in a beautiful venue (situated in a garden) and we were also able to meet and dine with farmers who spend their lives raising and growing our food. It doesn't get any better than that. So, the dinner was hosted by Illinois Farm Families, which is part of the Illinois Farm Bureau with the theme, "One State, One Plate, One Story." I've been working with them for about four years now since I was selected to be one of the individuals in their City Moms program. It was such a great experience being part of this group of about two dozen Chicago area moms who were interested in learning more about where our food comes from. Throughout the year we attended different events and farm tours to get a look at what farmers do, how they do what they do and how they raise families themselves. I gained a huge appreciation for the hard work that goes into producing food and an even greater fondness for those that choose this vocation - or more often are born into it. It was great to meet people that were in the 4th and 5th generation of running of family farm. 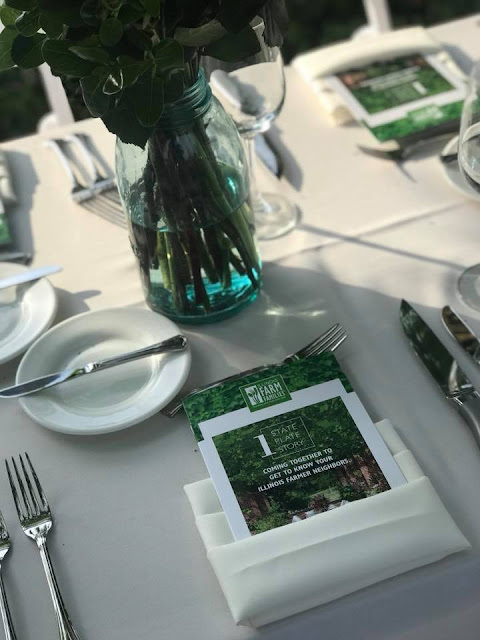 Anyway, I've stayed connected with Illinois Farm Families since participating in that program in 2015 and I was excited to get this invite for a farm-to-table dinner to showcase some of the food grown/raised by their partners. Our dinner was held at an amazing venue, the Chicago Botanic Garden. I have had a visit on my summer bucket list for a couple years and just haven't made time to get there, so I was also excited to be visiting that venue for the first time. The grounds are stunning and I definitely have to go back and explore more. We dined in the Regenstein Fruit and Vegetable Garden, our table set beneath a trellis of grape vines. The garden is situated a way back on the property, so it was a lovely walk to get there. When I was invited, I was also asked to invite some other food bloggers, social media influencers and foodie friends and I was pleased that several of them could make it. It's always nice to dine with other foodies where you all "get it" and can feel comfortable snapping pictures of every course without your fellow diners rolling their eyes or shaking their head at you. Co-hosting the event was my friend, Johanna, who is a super talented cook and foodie personality and just all-around awesome lady and mom. She runs the site mommacuisine.com. Combining her love of food and her Filipino background, she created the wonderful recipes that we enjoyed during dinner. We started out with some passed appetizers and cocktails, including the signature cocktail of the evening, The Barn Door, created with Whiskey Acres Rye Whiskey with grenadine, ginger ale and a dash of orange bitters. Between each course we were introduced to a farmer and it was nice hearing from them. I'm always struck by their passion for what they do and how genuine they are. I have great respect for farmers and the hard work they do. I may have mentioned this on the blog before, but I am married to a firefighter - who really should have been a farmer. He's an early riser. He loves the outdoors. He loves planting and growing things. He loves animals. He loves farm equipment. Whenever we spend time on a farm, he is totally in his element. He talks about working on a farm or buying acreage in retirement so he can finally live out that dream of being a farmer. His father, who was born and raised in Germany, passed on his love of gardening. Throughout his childhood they had a large garden where they grew all kinds of vegetables. He's continued that here at our home with our boys and my oldest son, Brad, especially loves to garden. In the spring I usually buy some plants and he is in charge of the garden. He plants it and maintains it and then I get the benefit of picking and eating it. He also starts plants from seeds that he transplants into the garden. He, like his dad, loves the rural lifestyle, spending time on open space and planting and growing. He has spent summers working on a farm, has worked in a greenhouse in the spring planting flowers and has worked in the fall on a pumpkin farm driving a tractor out to the pumpkin patch. And speaking of pumpkins, my second son, Chandler, and his grandpa used to love to grown pumpkins together. One year they tried growing giant ones and ended up with some whoppers with several of them in the 70 - 100 pound range. They entered a farm bureau youth pumpkin-growing contest and won first place! It was a great experience for my son. We're a suburban family, but there's a lot of farming influence. So, that has made this connection through the City Moms program and Illinois Farm Families just that much more special. So, let me tell you a little about what we had for dinner. We started with this beautiful salad. Really, could a plate be any prettier? It's Johanna's Summer Grilled Peach Salad and I couldn't be more in love with this salad. It has so many things that I love. Summer Greens. Spinach. Grilled peaches. Applewood smoked bacon. Feta cheese. Candied pecans. And it was drizzled with a balsamic vinaigrette. It's a perfect summer salad. Light, yet could be a meal with the satisfying, substantial addition of the bacon and pecans for protein. I know I'm going to be dreaming of this salad for weeks to come. Our entree was a succulent and super thick pork chop that was cooked to perfection. The Citrus Grilled Pork Chop was served with black forbidden rice salad with edamame, sautéed summer squashes and mango papaya salad. Could not have loved this more. If you have never had black rice before, it's pretty awesome and really complimented this dish well. Johanna explained that you could substitute quinoa or pasta as well. We finished with an Upside-Down Blueberry Polenta Corn Cake with Orange Vanilla Custard Sauce. It was heavenly - not too sweet and perfect to enjoy now at the peak of blueberry season. Drew Kuhn raises pork and grain in Genoa with his wife and says that no two days are the same, which is something he loves about his job. Like a lot of farmers, he also has another full time job, which happens to be as a farm manger of another hog farm. He makes the most of technology in his work to help him do the best and most efficient job he can. Joni Bucher raises cows as a fourth-generation farmer in Western Illinois. She was close to age 50 when she started raising cattle full time and her two sons have been very active in showing cattle. One of her sons now works with her full-time running the farm. The cow/calf operation has about 90 mother cows who ideally produce one calf every year. She spends a lot of time in the pasture making sure her cows are happy and content. She said her philosophy is "to care for the environment and to do our bit to help feed the world...and of course, to raise quiet, happy cows." Andy Roselius of Crescent City farms with his wife and two children and considers himself an environmentalist as much as a farmer. His top priorities are sustainability and food safety. He learned farming from his dad and is now continuing the tradition on a 160-acre farm. He's actually a fifth generation to live and work on the farm. Tammy Wakely was raised on a hog and grain farm and married a guy who was raised on a dairy farm. They joined forces with another family in 1998 and together they run the Cross-Wake Dairy Farm. They have 120 dairy cows, 110 heifers and calves and grow 110 acres of hay and 170 acres of corn - both of which are used for the cows - as well as 20 acres of wheat. They also have four children and Tammy said that the most rewarding thing about faming has been seeing her children become committed farmers. Thanks to Illinois Farm Families for hosting this lovely event, helping us get to know some farmers and enjoy a beautiful evening of foodie friendship and wonderful food. Also, be sure to follow along with Illinois Farm Families at watchusgrow.org and follow them on social media.